“Soft, light and ever so small.” Is how I’d describe the Mini Monkey Mini Sling. In fact this one of the smallest baby carriers I’ve ever encountered… to my knowledge second only to the Suppori sling. It weighs just 187g. To put this into context my mobile phone weighs 156g, and its only just a little larger too. Fitting confidently into its one little integrated draw string bag, this little sling will easily fit into your handbag, beach bag, or even your pocket! Where the Mini Sling shines is as a “just in case” sling or a “I just need to…” sling. I.e. just in case the baby screams and refuses the pram while out and about, or just in case the toddler gives up walking after 30 minutes and I just need to get them home, or I just need to hang the washing out to dry and baby refuses to be put down. Or a lives in the car sling just in case you need something while your out. Because it is one shouldered and very thin, this is not a long Sunday walk sling or a wear all day sling. It’s very definitely for short periods only, you’d certainly get achy using it with a bigger baby for any extended period of time. But because its so fast and easy to take on and off it really does work for those situations where you need your hands back or need something to help take the strain of holding your child but only while you just make lunch, or just pop out to the corner shop for milk….. etc, etc. So how does it work? Well it’s simply a loop that you slip over your head. Baby goes in the pouch part, and then you do up the little yellow clip that tightens the upper part of the sling and finally tighten the sling as a whole by pulling down on the strap behind your back. Easy!! Really easy, easier than I expected in fact. Before trying the Mini Sling I’d assumed I’d struggle with the tightening being behind my back but actually the strap pulls at the same angle as your arm naturally takes which makes tightening really easy and feel really intuitive. It’s also really really fast! Literally takes just a moment to pop baby in and secure them. As because there are yellow clips on both edges this sling can be worn on either the left or right shoulder (you just do up which ever clip comes out on top). There is also a little loop of fabric for a leg. To be completely honest I didn’t use this, but the idea is that you can use this loop of fabric to go round one of babies legs and this makes the seat unpoppable – makes it impossible for baby to slip out of the bottom of the sling. I didn’t use this because I am more than confident slipping a baby into a sling like this and making a seat that I know is completely safe and will last as long as I need it to. But I often encounter parents who like the idea of a ring sling or pouch sling but get really nervous around making that seat and worry that their baby will fall out. I’ve literally never seen a baby fall out, but I understand that for the more nervous sling users I can see how this little strap of fabric to loop around babies leg will act to reassure. Even if it does add an extra step when it comes to getting baby in and out of this sling. Made from silky soft smooth mesh, this carrier is definitely one that will keep both you and baby cool. The mesh reminds me a little of the mesh you sometimes find inside of swimming trunks, and accordingly this carrier can be used in situations where it might get wet … i.e on the beach, in the pool or in the shower. At the moment it comes in white or black. I liked how visually striking the white is but I have to say if this was my sling I’d worry constantly about splattering it in tomato sauce or mud. So how does the Mini Sling compare to other slings? Broadly speaking its similar to a ring sling in that it’s fully adjustable and accommodates a wide range of body types and sizes. The main difference is that it doesn’t have a ring! Instead it tightens and loosens through webbing and a ladder lock buckle. This means it doesn’t have the ‘point by point’ tightening of a ring sling that really enables the fabric to perfectly mold to the child’s body. But the trade off is that it is easier – there is just one thing to pull and tighten. It pulls down across your back, which is a much easier motion than reaching around your baby or down from your shoulder in front, and you don’t have to think about tightening the top, middle and bottom separately… just one quick pull and your done. In fact its almost as fast as a pouch sling (such as the Suppori). But while pouch slings are sized and thus can’t be shared by other members of your family (unless they are the same size as you) the Mini sling is full adjustable, so combines the speed and ease of use of a pouch with the adjustability of a ring sling. In theory the Mini sling is suitable for newborn to toddler, and is weight tested from 3.5 to 15 kg. 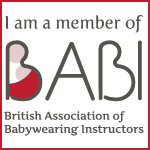 In practice where I see this sling being really valuable is nosy baby stage (often starts around 12 weeks-ish and lasts a good few months), and for up down just starting to walk toddlers. So really from 2-3 months through till about 18 months to 2 years. I think over about 18 month – 2 years its going it get very heavy very quickly. I think you could use this for a newborn, but without the point to point tightening this would never be my first choice for a very young more floppy baby. That said I didn’t get the chance to try it with a younger baby so perhaps I am being unfair! I did try it with a very nosy 5 month old and a 17 month old with little tired legs and it worked beautifully with both! My one worry with this sling is the little perforations in the mesh… I’d worry about them catching and this fabric being easy to hole. I might be being unfair, as there was no evidence of this over the two weeks I road tested this sling – but it will be something I would be watching out for. The final real selling point of this sling is the price. It’s tiny – just £35 from the Sling Spot or 35 Euro if you order from Mini Monkey directly (although this comes with a hefty postage cost, while the Sling Spot do free postage so works out cheaper unless you have family in Europe!). So while this will never be a main long walk, do everything sling … it’s a great auxiliary sling… the one that lives in the bag or the car ready for quick carries.